Singing, playing instruments and listening to and talking about music have been a big part of people's lives at Clearwater for many years. A changing group of girls have been members of a small choir for several years. A few students have become proficient at guitar or drums. A few poke around on the piano or take a few lessons. 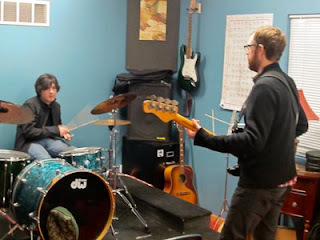 This year, enough people are interested in learning to play guitar and drums that staff member and musician Matt Garrity has set aside two mornings a week for scheduled lessons. Four girls are learning to play the guitar and, in addition to their weekly lessons, spend time practicing on their own and learning to play guitar and sing at the same time. Two teenage boys spend hours each week with each other, alone or with Matt on drums, playing electric guitar and bass. 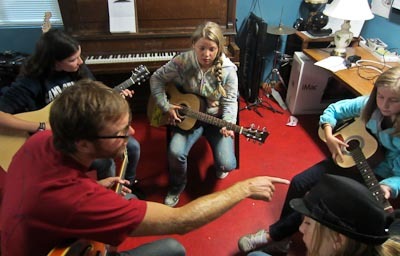 A couple of girls are writing original songs with music and lyrics, consulting with Matt. There have been some piano lessons this year, too. 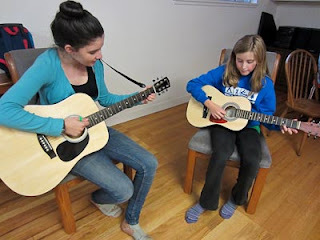 Some of the girls who are in the choir are also taking guitar and piano lessons. What they are learning about playing instruments adds to their understanding of how music works and deepens their singing skills. 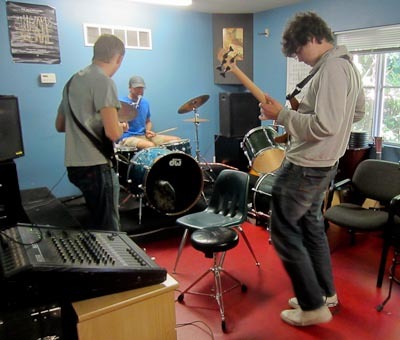 It is rare for the music room to be empty for extended periods. Usually, someone is taking a lesson, practicing in a group or alone, or jamming. 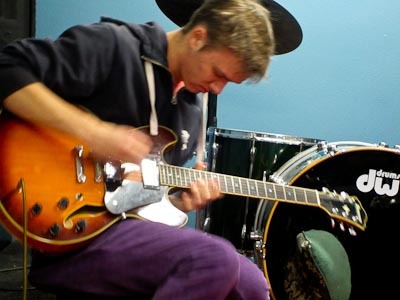 Watch this video sample of some of the music making at Clearwater over the past several weeks. The video shows people not performing, but practicing--working to get better at playing an instrument, to create rhythm, melody and harmony, to compose a song which was later discarded, to play the same chord progression or improvise something new together, and to help each other increase their skills.